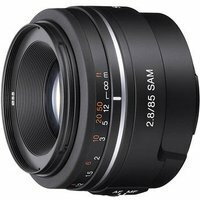 The Sony 85mm f2.8 SAM Lens is a light, compact full-frame prime lens that is ideal for portraits on full-frame cameras and great for general purpose mid-telephoto applications on cameras with APS-C sized sensors where it provides an angle of view equivalent to a 127.5mm focal length lens. It provides clear, sharp corner-to-corner imaging, even at maximum aperture, where the circular aperture design creates beautiful defocus effects. The Sony 85mm f2.8 SAM Lens features a Smooth Autofocus Motor (SAM) for smooth AF operation and a focus mode switch for greater creative control of focusing.